Knowing who is taking action on content can be critical in helping your organization fulfill its compliance requirements. And as usage of a cloud service grows, it’s key for IT to strike the right balance between visibility and user enablement. Today, we’re announcing an important update for admins—the ability to audit and report on numerous activities that take place within SharePoint Online and OneDrive for Business, as well as new file size limits for files uploaded to SharePoint Online and OneDrive for Business. Previously, we’ve announced a set of investments in auditing and reporting across several Office 365 services. We’ve now started to roll out some of these capabilities in the reports section of the Office 365 Compliance Center, including auditing and reporting on user and admin activities logged from SharePoint Online and OneDrive for Business, and the ability to view activities in Azure Active Directory (the directory service for Office 365) and Exchange Online. From the Reports tab in the Compliance Center, you can create activity reports by clicking Start recording user and admin activities. Activities include file and folder actions such as view, create, edit, upload, download and delete; sharing actions like invitation and access requests; and synchronization activity. Reports can be tailored by user or by file within a specific date range. They could be used for instances like a compliance review where an admin or compliance officer needs to understand actions taken by one or more individuals within their OneDrive for Business or the actions taken by all people on a specific file in a SharePoint Online document library. From the Office 365 Admin Center, open the Compliance Center and click the Reports tab to access the Office 365 activity reporting tool. Currently, audit history is retained for 90 days and admins can export results to a CSV file for additional reporting in Excel. Auditing data can also be consumed using the Office 365 Management Activity API (now generally available), which provides a consistent schema across all activity logs and allows organizations and ISVs to integrate Office 365 audit data into their security and compliance monitoring and reporting solutions. 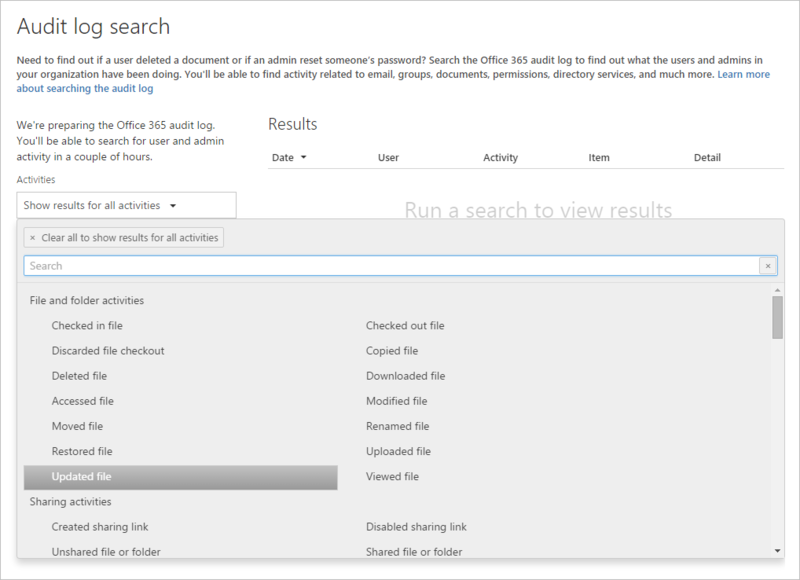 Learn more about how to search the audit log (includes information that describes all activities that are audited in Office 365). In future releases in Q2 of this year, we’ll be introducing new usage analysis reports that allow admins to see key metrics such as number of active users, total number of files and total storage consumed as well as drill into OneDrive usage for individual users. In addition to the new auditing and reporting capabilities, we’re also increasing the per file size limit to 10 GB. This applies to files uploaded to Team Sites, Office 365 Groups and OneDrive for Business, as well as for videos uploaded into the Office 365 Video portal. Office 365 customers no longer need to leave big files stranded on file shares and local hard drives. Example of a large CAD file successfully uploaded into a Team Site Document Library in SharePoint Online. 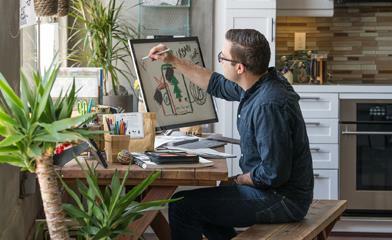 Example of a large Photoshop image file successfully uploaded to OneDrive for Business. The amount of content in Office 365 is growing 300 percent year over year. To meet your needs for more storage, we’re increasing default storage to 1 TB plus 0.5 GB per user to use across SharePoint Online, Office 365 Groups and Office 365 Video—up from the previous allocation of 10 GB. This is in addition to the unique default per-user OneDrive for Business storage space and individual storage provided for user email inboxes. Office 365 customers on our premium Enterprise, Government and Education plans will receive OneDrive for Business unlimited storage, and we’re pleased to announce that the first stage of providing 5 TB for each user is now complete. And if you need more storage beyond default allocations, you can purchase additional storage from within the SharePoint Online admin center on a per-gigabyte (GB), per-month basis. You can manage pooled storage per the new usage storage model. All of the above updates are covered in more detail in the SharePoint Online: software boundaries and limits article. Note: Kiosk and external users do not contribute to the overall tenant storage pool. Sites page refresh—The Recommended Sites have been vastly improved with intelligence from the Office Graph, and you now see Recent Sites listed, making it easier to find sites and portals in Office 365. Exchange Web Services and Exchange Online Protection (EOP)—Now, emails for user-generated actions in SharePoint Online, like when a document is shared, are sent mail from the user’s Exchange Online mailbox, making delivery more reliable and resulting in fewer of these emails landing in the spam folder. For more details, read this article. 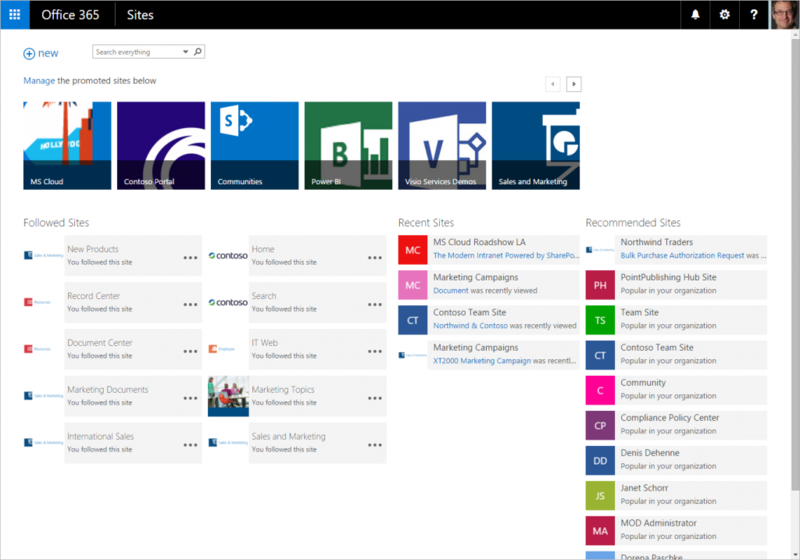 The Office 365 Sites tile now shows Recent Sites and Recommended Sites powered by the Microsoft Graph alongside Promoted Sites managed by admin and Followed Sites selected by users. We welcome feature requests and feedback via the Office 365 UserVoice, @SharePoint and @Office365 on Twitter and in the comments below. We’re eager to hear your feedback and use it to provide the best experience possible. Q. Do the new auditing and reporting capabilities require a specific Office 365 configuration? A. In order to use the auditing and reporting capabilities, customers must have Exchange Online. Q. Does OneDrive for Business offer the ability to control auditing and reporting by country or by tenant? A. Currently Office 365 auditing and reporting is available at a per-tenant level only. There are no customer-facing controls yet to target by geography. Q. When can I expect to see these changes applied to my Office 365 tenant? A. Beginning today, these changes are rolling out to eligible Office 365 business customers worldwide. We expect to be at 100 percent rollout within the coming weeks. Q. Which Office 365 plans will receive the 1 TB default storage SharePoint Online improvement? A. Office 365 plans that include SharePoint Online will receive 1 TB of default storage across enterprise, education and government plans.